Comments: Broadleaf evergreen native to Flinders Range in South Australia. 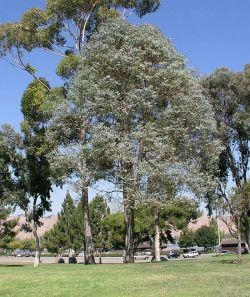 Silvery green ovate leaves, yellow flowers, and creamy white smooth bark that sheds in short strips. Species maintains juvenile leaves throughout its growth.